This multi-function instrument can be used as a continuous area monitor, a portable survey meter, or a hand and shoe contamination monitor. It can be powered by wall current, or by its built-in rechargeable battery. Audio features include a built-in speaker with volume control providing click-per-event or an audible full-volume alarm. The alarm can be set at any point on the meter scale and locked. A red lamp on the meter's front panel also indicates an alarm condition. A push-button resets the alarm and zeros the meter. The built-in battery is continuously trickle charged when the unit is operating on line power. 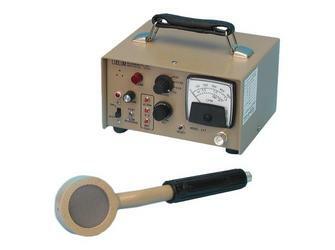 The external pancake probe monitors alpha, beta, and gamma radiation, and is the preferred detector for the majority of medical surveying applications. 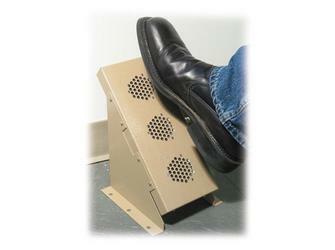 The Pancake GM Foot Monitor serves as a convenient shoe contamination monitor. Four multiplier settings (x1, x10, x100, x1000), threshold adjustment from 10 to 100 mV, and a toggle switch for FAST (2.2 sec.) or SLOW (22 sec.) response make this unit suitable for a wide range of medical applications. Data-out Connector: 9-pin type "D" type series plug with connections as follows: Pin 1: Battery terminal; Pin 2: Unregulated supply; Pin 3: Instrument common ground; Pin 4: Alarm sink; Pin 5: Pulse out; Pin 6: Unbuffered output; Pin 7: Recorder output; Pins 8 and 9: Spare pins.